Designed to be easy to read and perfect for busy people who have little time, this unique book provides an introduction to the new concept of Failure Mapping by comparing typical functions in an organization which benefits from Failure Mapping to one without. Through examples it shows how individuals in different roles can have their effectiveness enhanced by having access to historical Failure Maps describing past failures. While few of the individual concepts are new, the approach described ties established concepts together in a new and comprehensive manner. This resource describes the process used to create Failure Maps that connect Malfunction Reports (Function - Behavior) with Failure Modes (Component - Condition) to help users clearly understand the most likely final disposition based only on the initial report and the statistics produced by historical experience. It is sure to be found useful by novice Reliability Engineers, Maintenance and Reliability Managers, Engineering Managers, Plant and Corporate Senior Staff and Executives looking for ways to enhance performance, and Consultants who may want to enrich their portfolio by adding this tool. • Describes issues that are particularly important to creating Failure Maps that record failure histories in a manner that the records will be useful in the future. • Explains how Failure Maps can be used to improve reliability by identifying Failure Mechanisms while at work. • Details how Failure Maps can be used to improve reliability by identifying Defects before failures can occur. • Describes how Failure Maps can be used to increase the effectiveness of the diagnostic and troubleshooting process as a part of any help desk activity. • Explains how to use Failure Mapping as a tool to improve the effectiveness of "triage" as a part of failure response in high volume activities. • Includes several forms found useful in recording Failure Maps and creating reports. 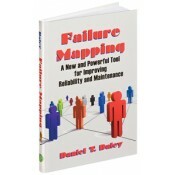 • Provides readers with tools needed to enhance and set up their own Failure Mapping program. • Offers both new and more experienced plant and shop personnel with a tool they can use to develop a consistent understanding of Failure Mapping, the roles in a Failure Mapping organization and the steps in implementing a Failure Mapping process.